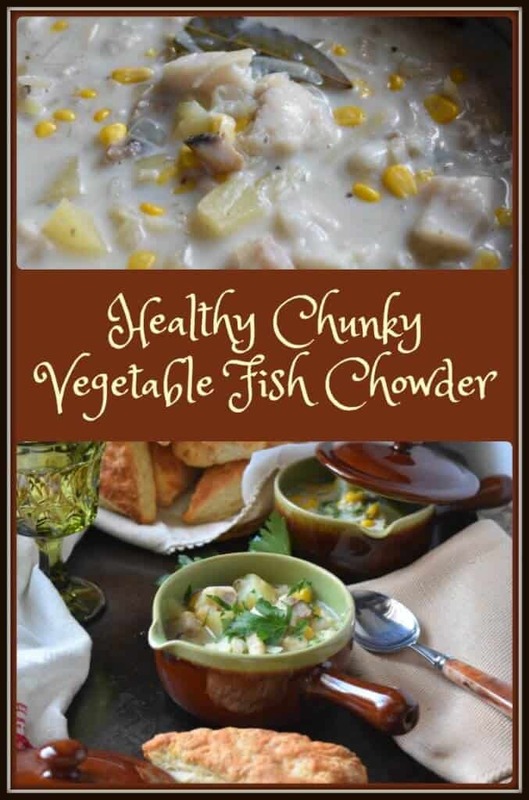 Today, I am sharing a Healthy Chunky Vegetable Fish Chowder with all of you. You are probably wondering whether a chowder can be delicious and healthy at the same time. Well, if you have a minute, come and take a look! There truly are so many different versions of chowder, and I have no doubt that every one of them is appetizing. But are they healthy? As a dietitian, I will always encourage healthy eating habits. Nothing earth shattering… no big sacrifices… just a few substitutions, a little bit at a time. That being said, let us consider a simple dish like a chowder. I have to say this was not a food from my childhood, and as such I do not have a story or an emotional tie to any fish chowder recipe. So, yes, it might be easier for me to play around with the ingredients to come up with a lighter and healthier version. But, you might be pleasantly surprised at how tasty this chowder is, despite the fact that we are using healthy ingredients. As an example, did you know that just 1 cup of half and half cream has 315 calories and provides you with 28 grams of fat? Compare that to 1 cup of 2% milk which has 122 calories and only 4.8 grams of fat. Yeah, I know that half and half tastes great… but what can I tell you… those are the numbers. When you begin to realize that small changes can have a big impact on the nutritional value of what you eat, what do you do? The important thing is that you realize you have the choice and the knowledge to make the change. 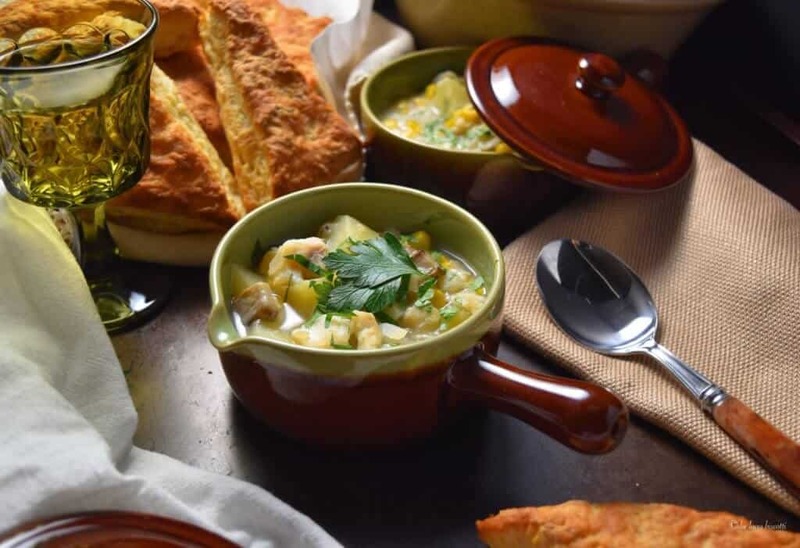 So, you have probably guessed that there will be no cream in this Healthy Chunky Vegetable Fish Chowder, but let me show you how it can still taste great. Okay, so once again, we start this soup with a drizzle of olive oil in a large stock pot set over medium heat. Add the onions, mushrooms and celery; and sauté for about 5 minutes or until the vegetables become slightly softened. Add the minced garlic and cook for barely a minute, stirring frequently. We do not want to burn the garlic as this will cause our fish chowder to have an unpleasant aftertaste. Add the wine, fish stock, the diced and grated potato, bay leaf and oregano. Once your masterpiece begins to boil, cover, reduce heat and simmer for about 10 minutes or until potatoes are tender. Just like in this recipe for Easy White Kidney Bean and Spinach Soup, the grated potato contributes to thickening the broth. It is now time to add the fish. Once again, we need to cover the pot and simmer for 3-5 minutes or until the fish is opaque and flakes easily. I used haddock fillets, but sole or cod works just as well. Then it is just a question of adding the corn and milk and heating it through. You can now discard the bay leaf. Just before serving add lemon juice and garnish with parsley. If you are like my husband, this is where you would add some heat in the form of hot peppers. And there you have it! 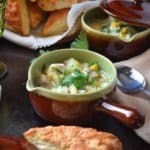 A Healthy Chunky Vegetable Fish Chowder that is light and simple tasting. Nothing complicated because in my books, simple is where it is at. And when served with these buttermilk biscuits, well, I usually do not get any complaints. Even as a young dietitian, I was always looking for recipes and cookbooks that focused on healthy eating. One of my favorite cookbook authors was (and is) Anne Lindsay. The original recipe can be found in “Anne Lindsay’s Light Kitchen”… published all the way back in 1991. I like to share with all of you some of the modifications that I’ve made to this recipe. In essence, I switched the proportions of vegetables, eliminated the carrots and played around with the herbs. I also replaced some of the fish stock with white wine. At the risk of sounding repetitive, you truly can personalize almost any recipe and make it your own. And if you chose to replace with a healthier food choice, well guess what? You are taking that one step to eating healthier. 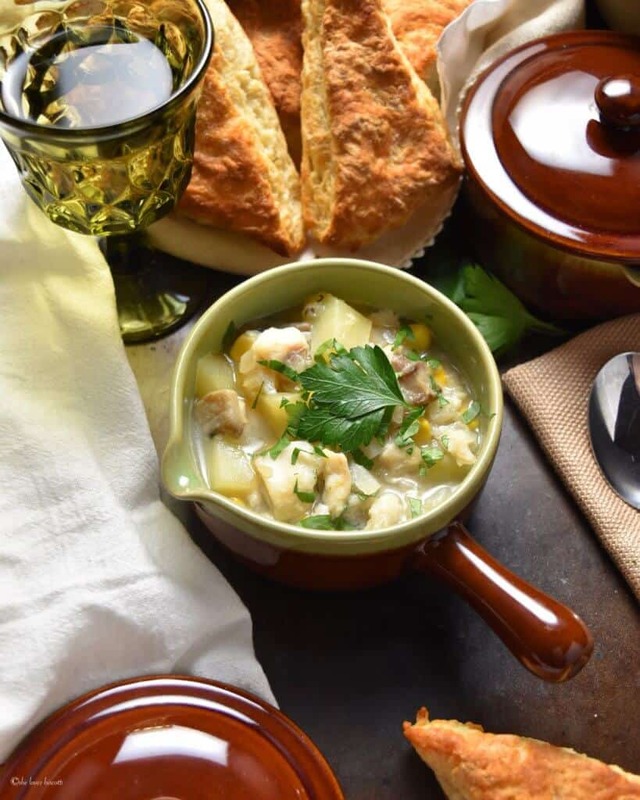 Here's a Healthy Chunky Vegetable Fish Chowder recipe. 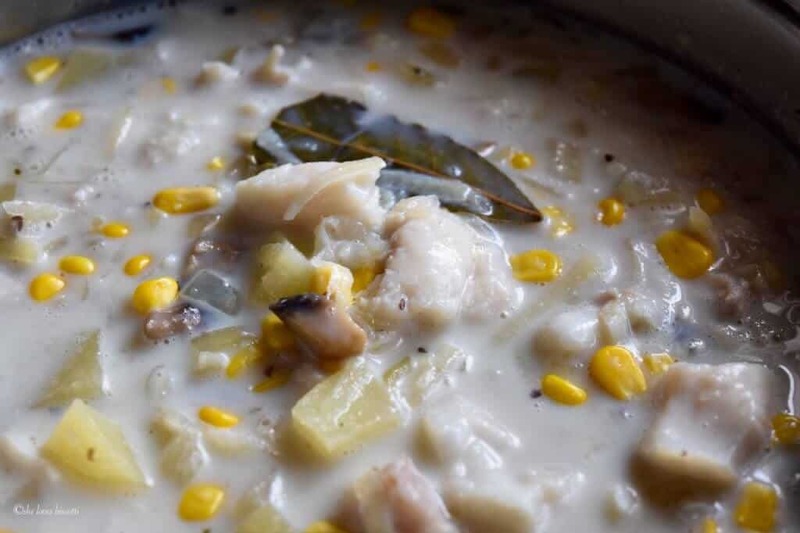 Can a chowder be delicious & healthy at the same time? Well, if you have a minute, come & take a look. Place a thick bottomed pot over medium-high heat. 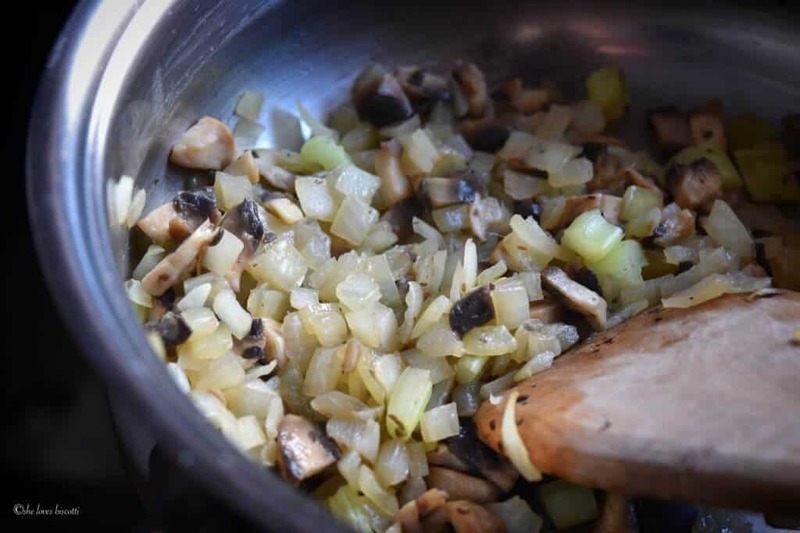 Sauté onions, mushrooms, and celery while stirring frequently for about 5 minutes or until the vegetables begin to soften. Add the minced garlic and sauté for another minute or so. 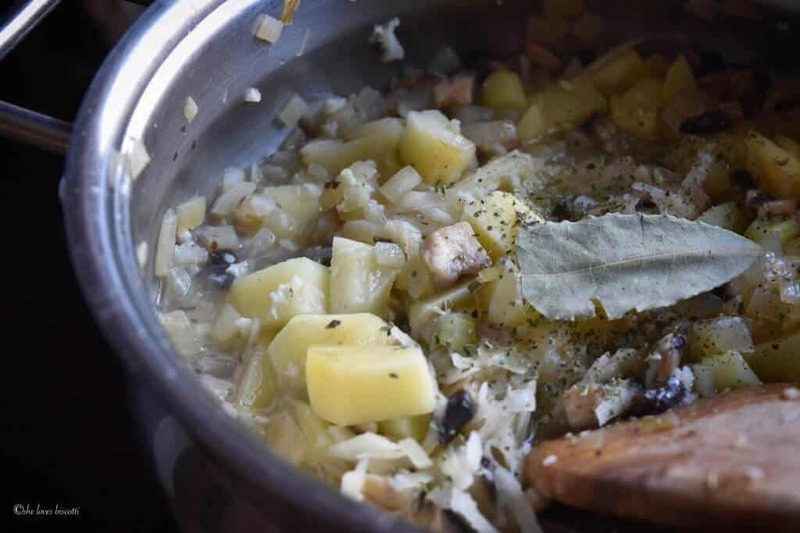 Add the wine, fish stock (or water), the diced and grated potato, bay leaf and oregano. Cover, reduce heat and simmer for about 10 minutes or until potatoes are tender. Add the fish, cover and simmer for 3-5 minutes or until the fish is opaque and flakes easily. Add the corn and milk and heat through. 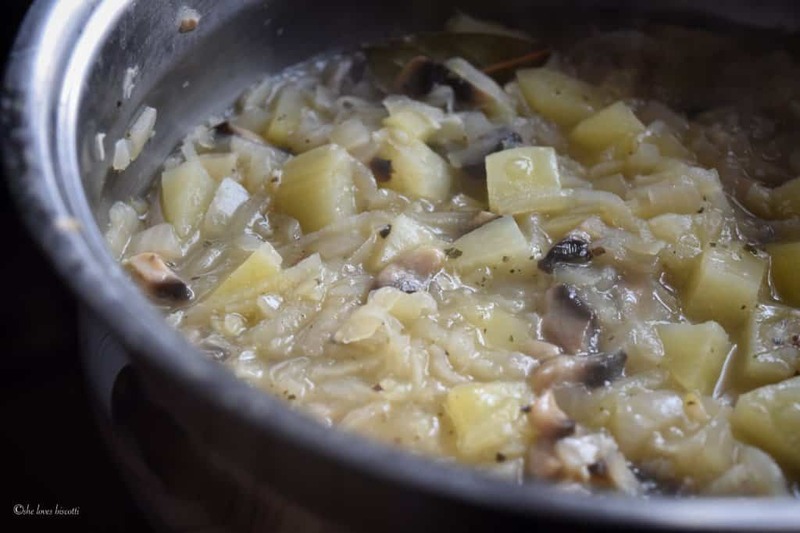 Your chowder sounds good…I’ve never added mushrooms to a fish chowder before but will definitely by trying it the next time I make one. I agree with you about 2% milk, I use it in most recipes to lighten up the calorie and fat content. Hi, I saw your recipe Sunday night and your chowder recipe sounded so good to make on Family Day on Monday here in Ontario. I had all the ingredients and so I decided to make it and was a real hit. The only thing I didn’t add was the milk I just added more water and it still tasted great. Thanks for the recipe and will definitely make again especially on a cold winter day. A stick to the rib recipe. I simply love this recipe! Of course the creamy chowders are satisfying, but who eats that way anymore. 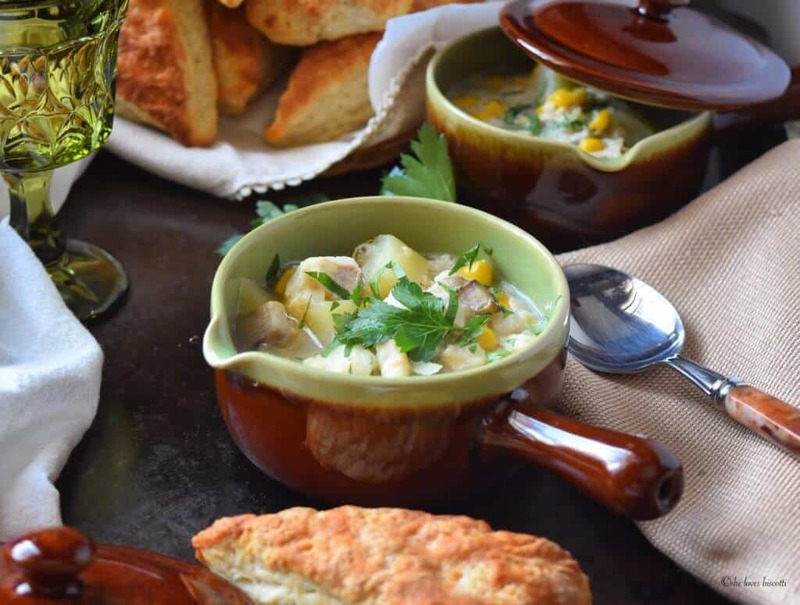 This chowder looks like it is full of flavor and comforting. Thanks Paula… just like you, we love our soups. We try to keep them healthy… most of the time 😉 Thanks for taking the time to comment.